Tech Blog Code of Ethics. Our Cartoonist noticed a number of tech blogs quoting one another and pronouncing the death of Google Plus. Three men are seated at a curved table. Man 1: Let’s post a 10,000-word story tonight. Man 2: Because you overheard some random guy in a mall? The next panel shows the exterior of a building bearing a large sign that says: TechGrunts. Voice from building: Under our code of ethics, we can’t just make up 10k words. The next and final panel shows the same three men. Man 1: How about 5k words? Man 2: I’m halfway there already. All three men gesticulate outward and upward with their arms. 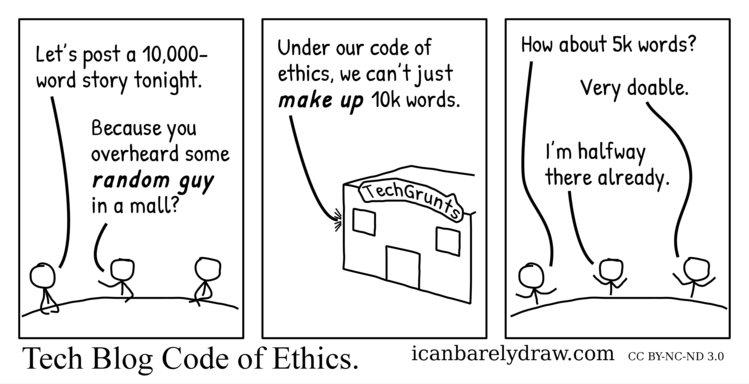 Title: Tech Blog Code of Ethics.